Hello there!! I know that It’s been a while since the last time I posted something. I have been trying to update the website and make some improvements. I just been very busy at work and I kind of been slacking on my photography. I am trying to change that and re-evaluate updating my blog weekly, I think that was too ambitious in my part. I will do my best to post every few weeks, I think that is more realistic than a weekly posting. For this posting I went back to one of my favorite places to photograph in NYC at my favorite time of the year, fall. I was able to leave work early one afternoon and I work near the south east entrance (59th Street and 5th Ave) of Central Park so I just started walking from there. I headed up north through Central Park Zoo and then headed north west. 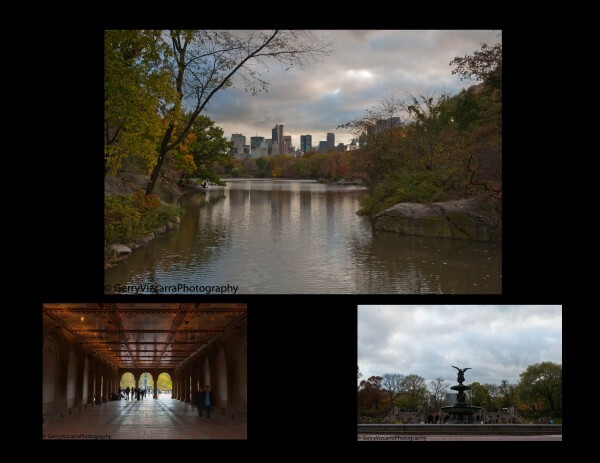 The top picture was taken from Oak Bridge, a narrow arm of Central Park Lake at its northernmost tip connecting the path along the West Drive and the Ramble. I love this picture because I like how the buildings just kind of pop out behind the lush trees and this beautiful lake. The bottom two pictures are of Bethesda Fountain. I have photographed this fountain many times but I just love coming back here. Under the Bethesda Terrace is the lower passage, it’s a must see in my opinion. I just love photographing this passage. The colors and the fine detail on the walls and ceiling are just amazing and as an added plus there’s always some type of musical performance. I hope you enjoy these pictures as much as I enjoyed making them and I’ll see you guys on the next update. As usual please leave questions, comments and/or suggestions.